Endless Adventure Awaits in Orlando! Are your clients dreaming of the perfect vacation? They’ll find it in Orlando – as well as thrilling rides, awe-inspiring performances and unforgettable character encounters at our theme parks. Before they go, provide them with our insider tips for the best theme park experience, details on classic park attractions and a free copy of our Orlando Holiday Guide. You’ll also be interested to know that Orlando attracted 72 million visitors in 2017, who continue to benefit from new attraction openings and recent upgrades at Orlando International Airport. 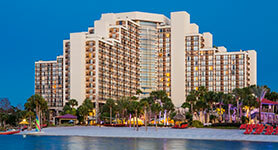 Learn more below to help your clients plan an Orlando getaway today! The official numbers are in, and Orlando welcomed a record 72 million visitors in 2017! That number should come as no surprise to those who know how much the destination has to offer, including world-famous theme parks and attractions, acclaimed dining, unparalleled shopping and a host of other unforgettable experiences. Already J.D. Power & Associates’ No. 1 mega airport in terms of customer satisfaction, Orlando International Airport (MCO) continued to improve in 2017, with more to come in 2018 and beyond. Get a look at the airport’s latest amenities, including all-new passenger trains, information-packed LCD screens and other features. Visiting Orlando’s theme parks is always amazing, but a little planning and knowledge can make the experience even better. Whether it’s your clients’ first trip or they want to refine their approach, share our advice for the best theme park adventures, including what to bring, the best routes and even how to avoid lines! Orlando is a forward-looking destination, but we also love our past! Check out theme park rides that have been thrilling guests for as much as 40 years and are still going strong, including the Haunted Mansion® Attraction at Walt Disney World® Resort, E.T. 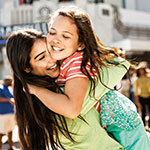 Adventure™ at Universal Orlando Resort™, the Sky Tower at SeaWorld®Orlando and many others. Give your clients the gift of Bed and Breakfast with breakfast for two and late checkout at Hyatt Regency Grand Cypress, a beautiful 1,500 acre resort. There’s a new way to put Orlando right at your fingertips. 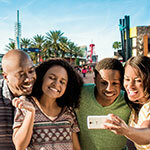 Suggest that your clients download the free App for a personalized Orlando experience.